I was in Homestead a few days ago when I found out about the existence of Larry, Curly, Burgers and Moe. Being a lifelong Three Stooges and Burger fan, it was no brainer that I’d have to stop in. The only problem? They were closed by the time I was ready to hit them up. A few days later aka today, el Comelon and I make plans to have lunch together and I insist on Larry, Curly, Burgers and Moe. I arrive first (as usual) and order a Stuffed Cheeseburger (w/American Cheese), Coney Island Style Hot Dog, Fresh Cut Fries, Cup of Chili and Buffalo Wings. While I’m trying to figure which table is best for sitting and taking pictures E.C. arrives. He tacks on a Double Cheeseburger w/only Onions and the Polish Boy, it’s a Cleveland thing. And apparently, we’re not having dinner tonight. I try not to have any expectations when I eat at a new restaurant since it isn’t fair. While waiting I could see everything being prepared from scratch, now I was excited. 1) The Coney Island Style Hot Dog was a perfect little ditty. No Hot Dog bun here, they use a sub roll which holds up to the all beef Chili. Speaking of the all-beef Chili, it had a nice sweetness to it. A great hot sauce would definitely compliment it. 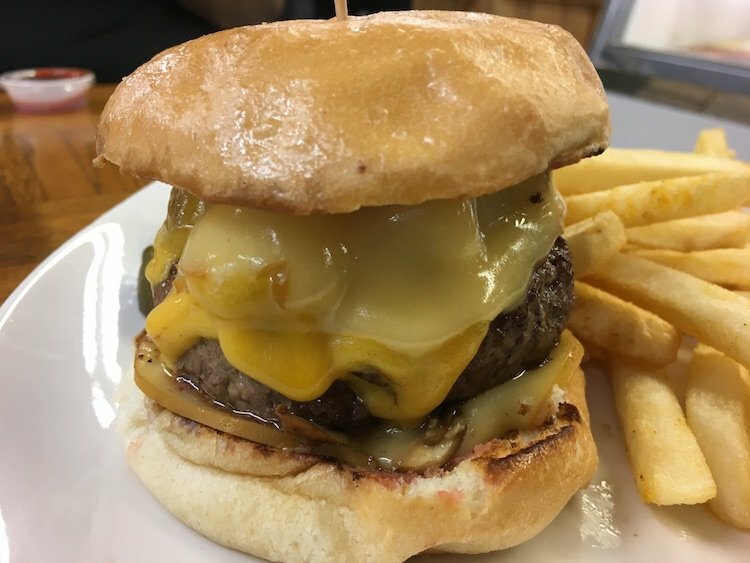 2) I love a great Juicy Lucy (Cheese stuffed Burgers) and I’ve had many in my time. This is one of the best I’ve ever had. It comes with Ketchup, Mustard and Mayo which I embraced instead of shunning as I normally do. The flavors really brought me back to being a kid and just enjoying a really good Burger without all the noise that exists nowadays. I’m looking forward to enjoying another one of these very soon. I also ordered a Blackened Chicken Sandwich to go for la señora Beast with some Cole Slaw. She is very picky about her Chicken Sandwiches but she dug this one. How else can I really end this other than saying I’ll be back to Larry, Curly, Burgers and Moe. It was a 40-minute drive that was well worth it and can also be a great stop on your way to or from the Keys. cant wait to try this place!